Hailing from the Brazilian metropolis of São Paulo – one of the largest cities in the world, and no less of a cultural melting pot than its North American equivalents – Dialeto are a modern take on the time-honoured rock stalwart of the power trio. Though they were formed as far back as 1987 by guitarist Nelson Coelho, bassist Andrei Ivanovic and drummer Miguel Angel – three musicians with extensive experience in the underground scene of their home town – and released an album in 1991, they went on hiatus in 1994, and surfaced again almost 15 years later. Will Exist Forever, released in 2008, featured the original content of their debut, including “Existence” (whose chorus line provided the title for the album itself), a composition based on a traditional theme from Pakistan and Afghanistan. Though the Middle Eastern connection may sound surprising to those who are not acquainted with Brazilian culture, it is deeply rooted in the social and ethnic makeup of the country. In a truly cosmopolitan city like São Paulo, people of Italian, Spanish, Portuguese, northern European, Middle and Far Eastern origin and a myriad others live side by side, and cultural cross-fertilization – even in matters relating to everyday life, like food – is a common occurrence. The members of Dialeto may have grown up listening to Western progressive rock, but in such an environment the influence of “world music” – as well as Brazil’s own peerless musical heritage – was always present in some way or another. The band’s music, a heady blend of angular, hard-edged prog as developed and perfected by King Crimson, haunting Eastern tunes, a pinch of that inimitably Brazilian sense of wistful melody, and more than a whiff of post-punk/new wave dynamics, seems to reflect their multicultural background. 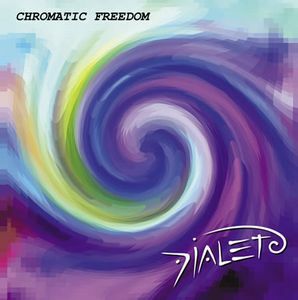 The title of Dialeto’s second album, Chromatic Freedom, refers to a specific concept derived from influential Hungarian composer Béla Bartók, and adapted to rock music – the exploration of the 12-note scale, also known as chromatic scale. The simple yet striking cover artwork reinforces the concept with a sort of visual pun. The essential role of cultural and ethnic integration in Dialeto’s sound is also rooted in Bartok’s artistic vision, as witnessed by the quote that introduces the band’s bio on their website. However, the album, far from being overly pretentious, is surprisingly approachable, its eclecticism realized in a streamlined rather than sprawling manner. Dialeto’s stripped-down format allows the three musicians remarkable freedom, their instruments emoting in synch or adopting a more free-form stance according to the requirements of the composition. They also produce an impressive amount of sound – a characteristic they share with the two King Crimson-related outfits that have been wowing American audiences these past few weeks, Tony Levin’s Stick Men and Adrian Belew’s Power Trio. All of these bands display an almost uncanny ability to produce endlessly intriguing textures using just the basic rock instruments – a markedly different approach to progressive rock than the traditional symphonic one. Just like King Crimson and its offshoots, Dialeto allow vocals into the equation, often using them as an additional instrument – at times gentle and soothing, at others harsh and assertive. Lyrics are both in English and the band’s native Portuguese – the latter, in my view, a much more interesting choice, especially as the unique phonetic features of Portuguese and its proven effectiveness as a vehicle for music inject a sense of alluringly exotic warmth in the intricate fabric of Dialeto’s sound. When listening to Chromatic Freedom, I was reminded of Texas-based band Herd of Instinct, another trio that made its recording debut earlier this year – though Dialeto lack the latter’s extensive use of touch guitars and the contribution of keyboards and other instruments to create eerie, ambient-like textures. 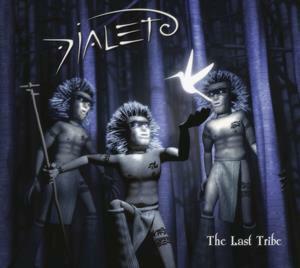 The bare-bones instrumentation adopted by Dialeto, as well as the insistent, aggressively riff-based nature of many of their compositions, has prompted comparisons with punk and post-punk – reinforced by the vocal style in songs such as “Train of Destruction”. On the other hand, the analogy with Herd of Instinct’s debut (or even some of Trey Gunn’s output) is most evidently borne out by the album’s longest track, the hypnotic “This Is the World”, where the three instruments begin in a subdued tone – paralleled by the muted, almost whispered vocals – then the guitar gains strength towards the end. Almost in a statement of intent, opener “Enigma”, propelled by Andrei Ivanovic’s pneumatic fretless bass and Miguel Angel’s tribal drum beat, skillfully blends echoes of King Crimson with Eastern-tinged chanting and eerie, drawn-out guitar sounds. The brooding bass line of “We Got It All” echoes the moody monotone of the singing, then the track takes a chaotic turn, with the vocals gaining a punk-like intensity; while the band’s signature tune “Dialeto” wanders into funky territory, with superb bass work throughout. The influence of Brazilian music emerges most clearly in the lovely, melodic “Falsa Valsa”, featuring a clear, piercing guitar solo, and in “Está No Ar” Brazil meets the Orient with a solid injection of abrasive Frippian guitar and towering bass lines. The most distinctly Crimsonian echoes, however, can be found the title-track, with its relentless, guitar-driven build-up, and the hauntingly atmospheric “Eu Me Lembro” – both of them bringing to mind the Wetton-Bruford period. Although King Crimson have been frequently mentioned in the previous paragraphs, I wish to dispel any impressions that Chromatic Freedom is in any way a derivative effort. Dialeto have a very strong individual imprint, and any influences are reworked and integrated into the fabric of a sound made even more distinctive by the Brazilian and Middle Eastern suggestions. While the presence of vocals may be seen as disruptive by faithful devotees of purely instrumental music, in my view it contributes to making Dialeto an almost unique proposition. With an ideal running time below one hour and a nice balance between shorter, punchier numbers and longer, more atmospheric ones, Chromatic Freedom will appeal to the adventurous listener, and to everyone who still believes that prog can actually be progressive.